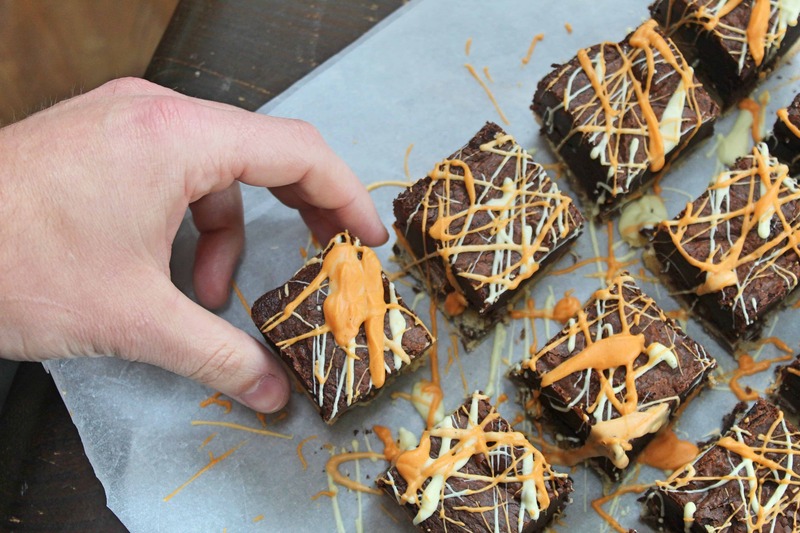 You guys seem to have been loving my Easter treats this year, so this week I’m bringing you the ULTIMATE gastronomical treat: gluten free Creme egg slutty brownies. If you have a major sweet tooth and you love those fondant-filled eggs, you’re going to absolutely love these. 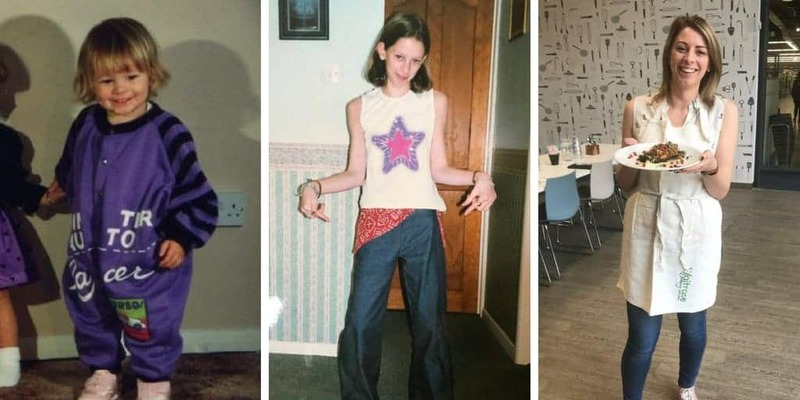 ‘What the hell are slutty brownies?’ I hear you ask! Well, prepare for a foodie education! These delicious goodies, first invented by (I think) The Londoner, and they’re named slutty brownies because they are just filthy! I’ve been dying to make a gluten free version of these original slutty brownies (coming very soon!) but as it’s nearly Easter I decided to start off with some gluten free Creme Egg slutty brownies. What is a gluten free slutty brownie? The idea is simple and also simply incredible. Start with a gluten free cookie dough base, cover this with mini Creme Eggs and then slather a gluten free brownie mix on top. Bake, cool and then cover in some funky Creme Egg-inspired white chocolate for a delicious and beautiful treat. 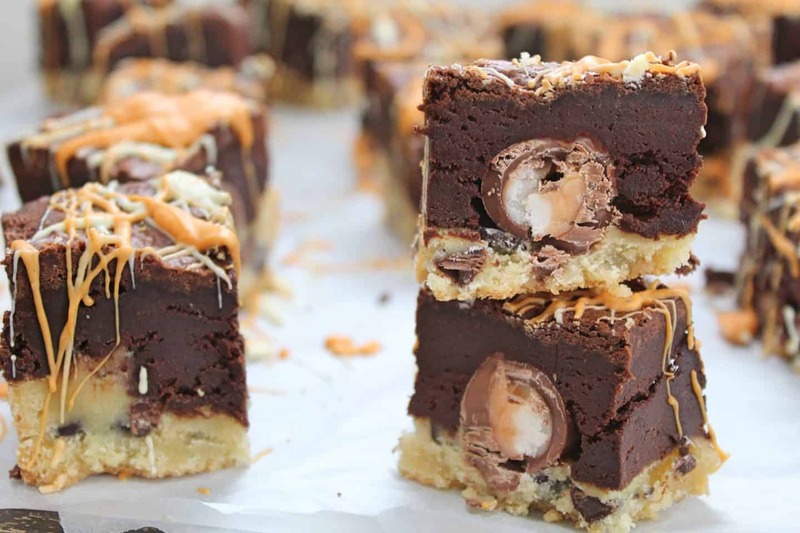 These gluten free Creme Egg slutty brownies then house the awesome surprise of a Mini Creme egg when you cut into them. What better way to make friends, eh!? I created the gluten free Creme Egg slutty brownies using the same brownie base as my other gluten free brownies recipes. If you haven’t tried them, I can thoroughly recommend my gluten free Creme Egg brownies or even my gluten free Mini Egg blondies, as it’s Easter! A nice think layer of gluten free cookie dough, and this stuff tastes amazing! As you bake it all together, it stays nice and soft, and with the gooey brownie on top it makes a seriously decadent treat! I was really happy with how well the mini Creme Eggs held their shape too. They just look amazing when you bite into them, and I love the decoration of the white and yellow chocolate on top too. I used 16 eggs so that when you cut it up, they’re like a Creme Egg surprise inside each of the 16 squares! However, if you wanted the visual effect of the Creme Eggs you could add more so that you cut through them when you’re dishing out the brownies. It’s completely up to you! You could try this with the full size Creme Eggs if you like, though it would be a lot more expensive and I’m not sure they would hold up as well as they may not be completely covered before baking. So here it is the, the best Easter bake ever! It looks like lots of ingredients but mostly this is store cupboard stuff, so don’t panic. 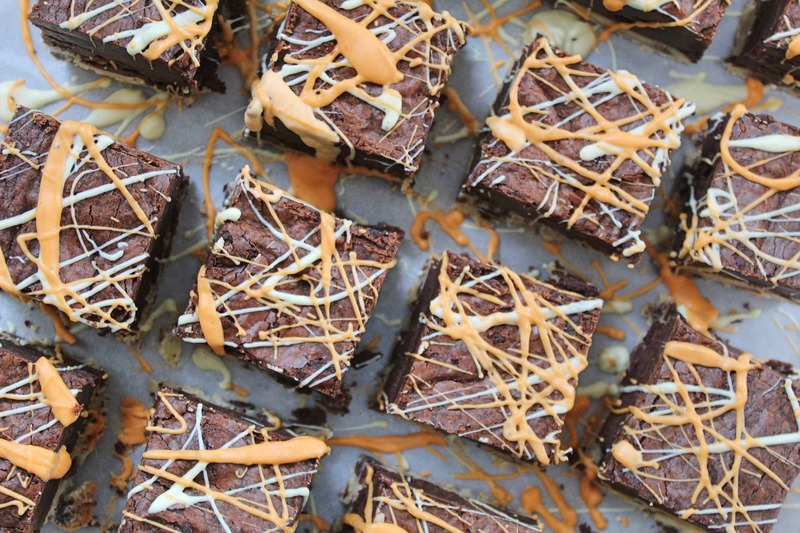 Let me know if you make these gluten free slutty brownies, I’d love to see your bakes! If you can bear it, it’s best to make these the night BEFORE eating, as they need to cool completely before you cut them – at the least leave them an hour or so on a cooling rack and then another hour or two in the fridge before slicing. 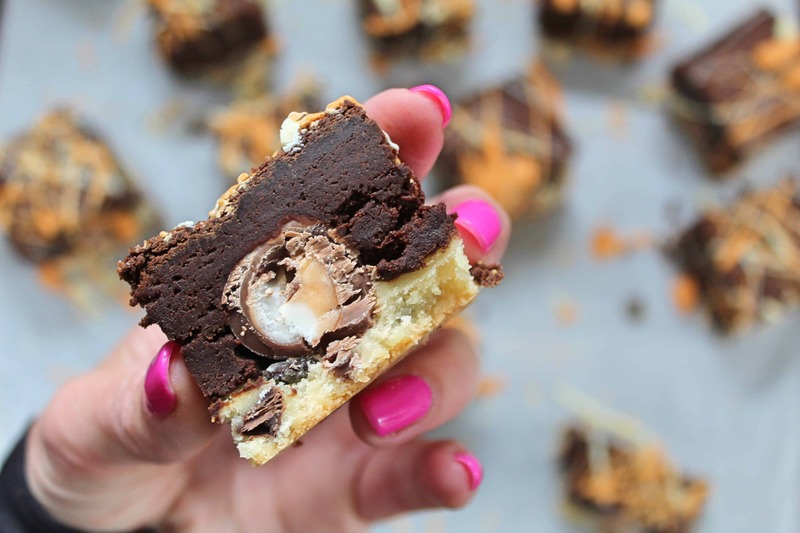 Gluten free Creme Egg slutty brownies are the ULTIMATE Easter treat! Coeliac friendly brownies with a gluten free cookie dough base and Creme Eggs! Preheat the oven to 170'C and grease and line a 20cm square baking tin. Set aside. Mix the butter and sugars in a mixing bowl with an electric whisk until light and fluffy. Add the eggs and vanilla extract and mix again until combined. Add the flour and, using a wooden spoon mix until fully combined. Add the chocolate chips and mix to distribute them evenly throughout the mix. Turn the cookie dough out into the lined tray and press down evenly to cover the bottom. Break the chocolate into a bowl and melt over a bowl of boiling water. Once melted set aside to cool slightly while you start the rest of the recipe. Melt the butter in the microwave and add to a large mixing bowl with the sugar. Using an electric whisk, mix together until combined. Add the eggs and vanilla extract to the sugar/butter mix. Continue to mix with electric whisker for a minute until the mixture pales and starts to go fluffy. Add the chocolate to the mix - make sure it is warm but not too hot or it will cook the eggs (not good!). Using a spatula fold the chocolate in and mix until combined. Sift in the flour and cocoa powder and fold the dry ingredients into the mix gently. You don't want to over mix. Once combined, pour over the cookie dough and Creme Eggs and gently spread the mix until the eggs are covered and it's smooth and even. Place in the oven and bake for around 40 minutes. The top of the brownie might appear a little wobbly still but this will set when it cools - you want them to be super fudgy! Leave to cool completely (overnight is best!) before cutting into 16 squares and serving! Need more Easter baking inspiration? If you’ve got the gluten free Easter baking vibe and you want to try some other recipes, here are a few to get you going! Previous Post My super simple gluten free tomato soup is a hug in a mug!